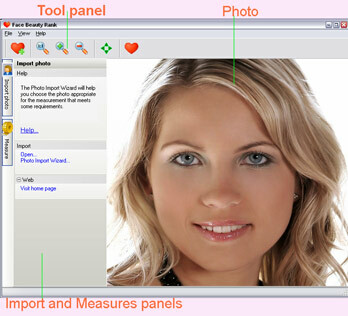 Evaluate the beauty of a face using the new program Face Beauty Rank. You will need only a photo for that. The word "beauty" always implies something nice, good, pure. Beauty is always subtle, barely perceptible. There are a lot of things written and said about it. It takes various forms and is present in all kinds of objects - material and incorporeal. And how much is there to the concept of "feminine beauty"? How much passion and fire there is in these words . We have always tried to preserve, increase and evaluate beauty. But how one can evaluate something that has no size, is subjective and varies greatly? Now it is possible with Face Beauty Rank! Do you want to evaluate the beauty of a face? Your own face, your friend's face? Or are you confused why everyone finds the face of a new star beautiful, while you do not think so? Do you want to know how your attractiveness will change after you put on makeup? Want to evaluate the beauty of a face in a new unusual way? Then Face Beauty Rank is for you! Dating online? Let Face Beauty Rank help you decide on your new date! Rank human faces objectively and automatically with a computer program to help you make a decision. Selecting the best picture of yourself out of a bunch of photos? Let Face Beauty Rank help you rank the beauty of every picture in your possession! Picking the best image will make you look good and will certainly help you make a better impression. Developing a dating Web site? Face Beauty Rank will help your visitors rank their photos objectively. By automatically selecting the best pictures of the uploaded bunch, you'll help your visitors find their perfect match! Face Beauty Rank is a unique program that is based on scientific algorithms assessing the beauty of a face. Of course, beauty is subjective. There are barely any algorithms, even the most complicated ones, that will allow you to "measure beauty completely". But we have implemented amazing algorithms with a history of thousands of years that can assess the beauty in one of its manifestations. The analysis of beauty in Face Beauty Rank is based on the golden section. It is an amazing proportion that can be used to estimate a Beauty Rank. The facial features that have the golden section in them are considered attractive while the exact correspondence is considered the ideal of beauty. So what is it . beauty assessment? Purchasing Face Beauty Rank is fast and easy, it takes you just a moment. If you are not ready to order yet, download the 30-day trial version of Face Beauty Rank for free. Easy to install and use. The program has an installation file that will help you install Face Beauty Rank on the computer. The user-friendly interface will help you correctly measure the Beauty Rank. Please do not take the results of the program too seriously! Do not criticize your self-esteem and the self-esteem of other people judging from the Beauty Rank!